The review team found that the chosen format for audience selection was not appropriate, but did not find bias or partiality on part of the Frontline team. FOLLOWING A REQUEST from the Broadcasting Authority of Ireland, RTÉ has published the working document of the editorial review of the Frontline Presidential Debate. RTÉ said that following consultations with members of the public who participated in the review on a confidential basis, it has concluded the redaction of the document. The independent report was commissioned by RTÉ following the decision of the Broadcasting Authority of Ireland (BAI) to uphold a number of complaints against the programme, and in response to concerns raised about the programme elsewhere. RTÉ has accepted, in full, the findings of the report and those of the BAI. RTÉ has worked over recent months to ensure the recommendations have been implemented. The working document states that there were no established RTÉ protocols for a Presidential Election debate. It said that in total there may have been up to 50 questions and questioners researched and prepared for the debate that night, and this high number created a very complicated ‘map’ for the debate that would in itself have created difficulties in monitoring overall balance on air. It states that the decision to finalise question selection close to transmission meant that the selection of a balanced range of questions would be done under the pressures of imminent broadcast. It also noted that the weather had an impact on the programme, and one questioner could not make it in and had to be replaced. The team had little experience of the editorial issues around working with audience members on the final wording of questions, as the standard Frontline format involved audience members making comments, it added. It emerged after the debate that one of the people who appeared, Dermot Fitzpatrick, had been an activist for a Labour Party councillor, Tom Kelleher, who was the father of an assistant producer on the show. Both men adamantly deny that Fitzpatrick was planted in the audience on behalf of the Labour Party or any other group, and Mr Fitzpatrick said that the question he posed to the panel was his own. The review team said the friendship between the assistant producer and the questioner had been disclosed to the rest of the production team, but in such a sensitive debate the format should have been clear that no personal friend would be chosen to ask questions. It should also have been clear that Mr Fitzpatrick’s previous involvement with a party running a candidate should rule him out as a questioner, said the document. But despite these concerns, the review team did not conclude that his appearance was as a result of political bias within the production team. One person was approached as a stand-by questioner, because there were fears another would not make it to the studio. He was not called on to ask a question of Martin McGuinness during the programme. The questioner was concerned about the motive about the question and that it may point to bias in the production team, but the review did not find evidence that the production team sought to soften questions to McGuinness. The review team concluded that it was wrong for audience members to have been supplied with questions originally devised by others, particularly where they had not previously expressed an interest or opinion on the subject. Question two arose in similar circumstances and was broadcast. This was a mistake. The programme could have been compromised if this practice had not been limited to one broadcast question. It was only by chance, or through the audience members’ own discomfort, that more of these questions were not put on air. The review team did not find evidence of bias or partiality from the presenter or production team, and said the mistakes made in the programme were not the result of bias. The review team did examine social media commentary by one of the assistant producers, which they found was unwise, but did not indicate a political bias. The review team concluded that, with one exception, all questions were founded on the views of the questioners as expressed during the research process. The review states the Frontline team at times stretched the definition of redrafting to a point closer to writing out exactly how the question should be delivered, but it found no evidence that this was done intentionally to influence the outcome of the debate. It said that too many questions were prepared and it was wrong that no direct challenging question from an audience member was posed to Michael D Higgins. The review team was told it was unintentional, and due to small number of questions about Mr Higgins received, and also bad weather. The review states the circumstances of the night of broadcast created an “unusually challenging environment” but RTÉ’s responsibilities were not diminished by external factors. A significant contributory factor was the lack of a senior editorial figure whose sole responsibility was to view the programme during transmission and identify editorial and compliance issues. According to the review, the chosen format for audience selection was not an appropriate approach for an election programme, and it blurred the lines between friends of the programme and personal friends of the production team. This left the programme vulnerable to the perception that opinions and questions were being sought out. The review notes the relative inexperience of the majority of the production team and that training procedures were limited in the current affairs department at that time. The review concludes with recommendations regarding format, audience selection, questions, editorial supervision, staffing and training. Email “RTÉ publishes working document of Frontline Presidential Debate review”. 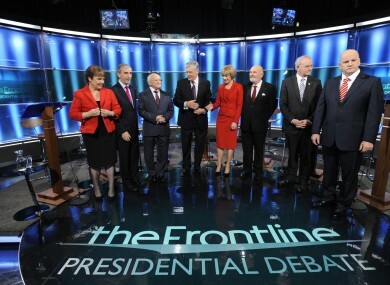 Feedback on “RTÉ publishes working document of Frontline Presidential Debate review”.